Feb. 9. Women’s professional golf returns to the Charlotte area later this year when the Symetra Classic is held at River Run Country Club. The 54-hole event will be played May 13-17, 2019. This will be the second year the event is held at River Run. The tournament was held at Raintree Country Club in Charlotte from 2012–2016 and moved to Atlanta National Golf Club in 2017. The event will give a boost to the local economy in terms of dinners out and overnight stays for those who follow the tour. In many cases the contestants themselves are put up by members of local clubs. The Symetra Tour is known as “the Road to the LPGA,” and since 1999 it has been designated as the LPGA’s Official Qualifying Tour. 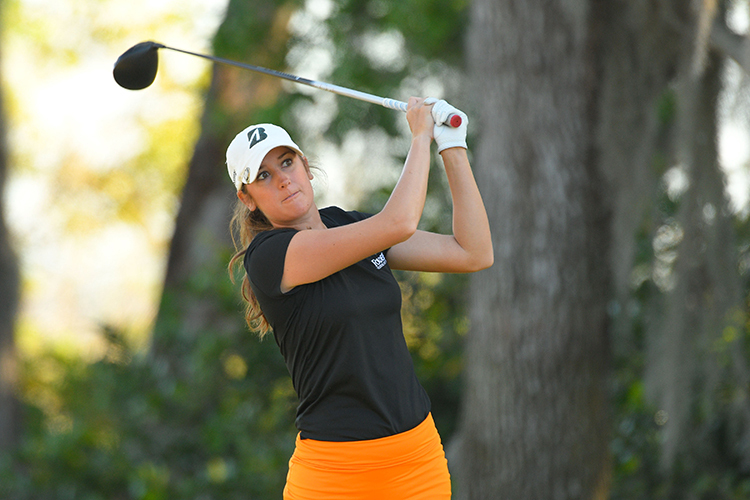 The Tour prepares the world’s best young women professional golfers for a successful career on the LPGA Tour. Last year’s Symetra Classic champion, Jenny Haglund of Sweden, finished 12 on the season ending money list and earned full time status on the LPGA. Allison Emrey (pictured) is from Charlotte. She began playing golf at five years old. Visit www.symetraclassic.com for more information about sponsorship, playing in the Pro-Am, volunteering and ticket sales.